I am directed to refer to IHQ of MoD(Army) letter No. 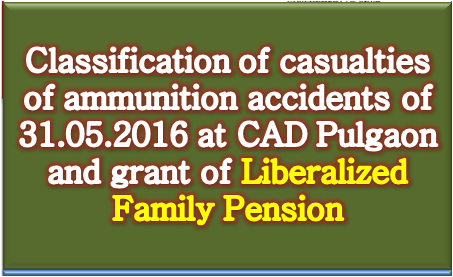 12841/13/2016/PC/AG/MP 5(d) (Cas Sec) dated 20.12.2016 on the subject mentioned above wherein it was informed that on 31.5.2016 a fire broke out in the Central Ammunition Depot (CAD) Pulgaon. While fire-fighting operations were in progress, at about midnight the entire quantity of mine stores in Explosive Stores House 192 with net explosive content of 135,275 Kgs detonated resulting in death of 19 and grievous injuries to 17 military, DSC and civilian personnel. As per the existing provisions, the death/disability of Armed Forces Personnel were classified as Physical Casualty(PC), attributable to Military Service. 4. This issues with the concurrence of the Finance Division of this Ministry vide their ID No.10(4)/2010/FIN/PEN dated 31.05.2018.